Nobody expected Russia to take Croatia to penalties. Nobody expected Russia to overcome the Spanish juggernaut. 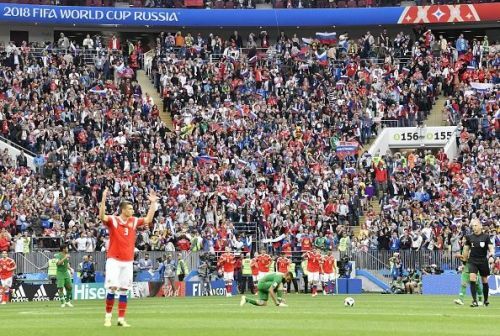 Hell, nobody expected Russia to get out of the Group Stages. Branded the worst Russian footballing unit ever assembled together, Stanislav Chercheshov's band of fighters rallied under their astute manager and the unstinted support of a deliriously surprised home crowd to a glorious quarterfinal run that showcased the very best of Russian values - dogged defiance in the face of insurmountable odds. Here, we try to pick out the three most pivotal protagonists of this fairytale. Sergei Ignashevich was born in 1979. He really shouldn't be able to play professional football in 2018 -- certainly not elite level professional football. In a sport where fitness and stamina and speed have become more important than ever, where physical conditioning often trumps pure footballing skill, he really shouldn't have been able to keep up. Just, no one told him that. Barring an unlucky own-goal he conceded against Sergio Ramos and Spain, Ignashevich had a superb, superb, World Cup - marshaling his defence astutely against far superior (on paper) opposition, using his vast experience to spread an eerie calm across the backline, and leading by example - no one's defended better than him in the entire tournament. Ignashevich's individual performance mirrored that of Russia's - defiant, courageous, skillful, and utterly masterful.